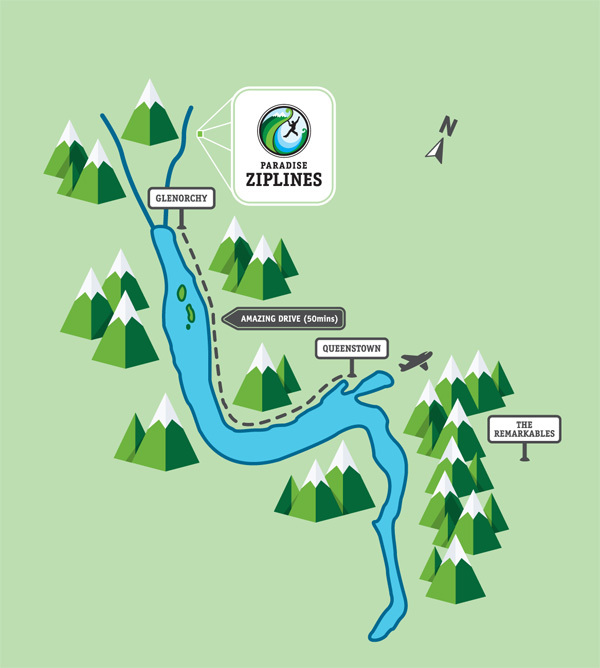 The Paradise Ziplines experience is an 8 line zipline course, which takes you on a very diverse journey by wire and walking track through the pristine native forest of the Oxburn stream valley. 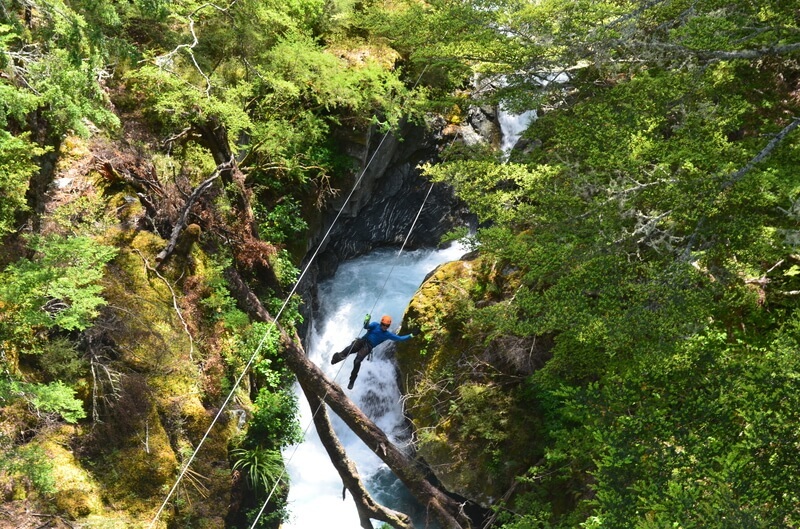 The lines vary; from up high and cliff to cliff, through forest canopy, to skimming the stream bed down its slot canyons, just metres above the rapids. 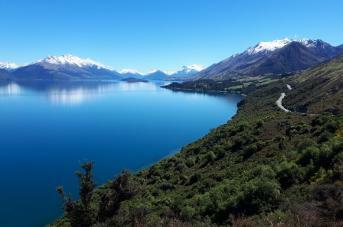 The drive from Queenstown to Glenorchy is rated one of the best in the world! 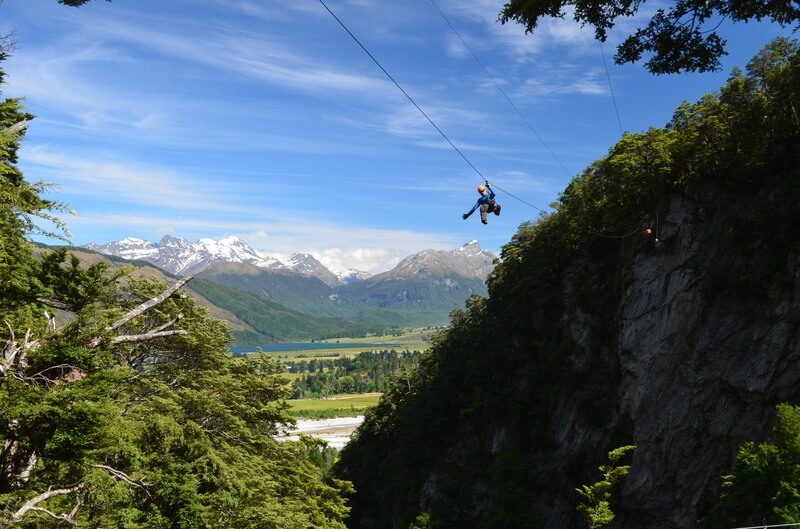 Ziplining, called a flying fox by some, is a fun and adventurous activity - not as extreme as bungy jumping or a canyon swing but more exhilarating than a stroll in the Queenstown gardens! 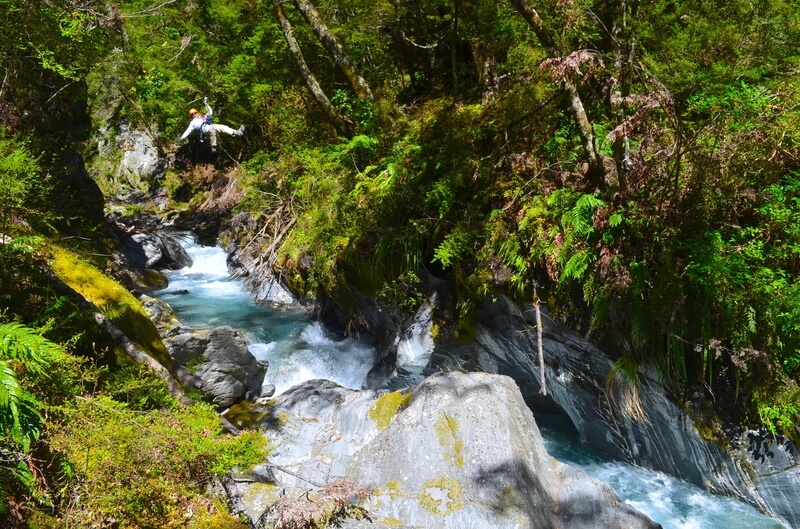 This is a perfect activity for those wanting to see some of the regions stunning scenery, experience the native forest and see an amazing slot canyon otherwise inaccessible to the public. 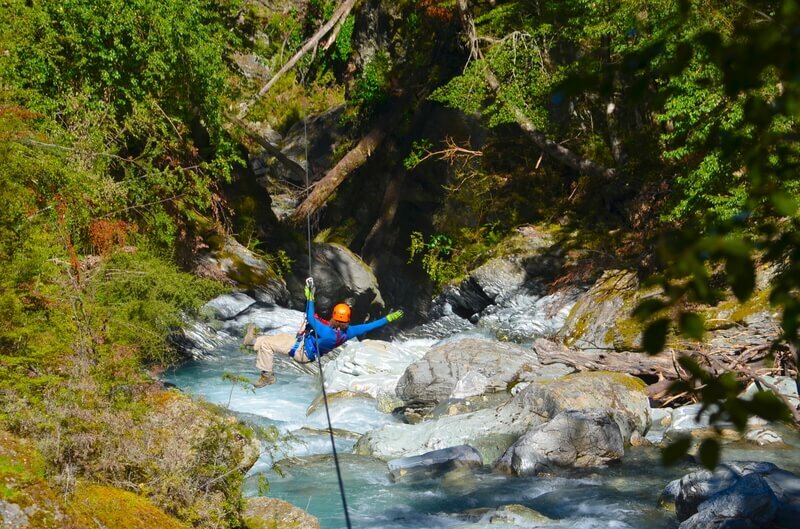 The thrill and scenery compete for your attention during the regions best ziplining experience. 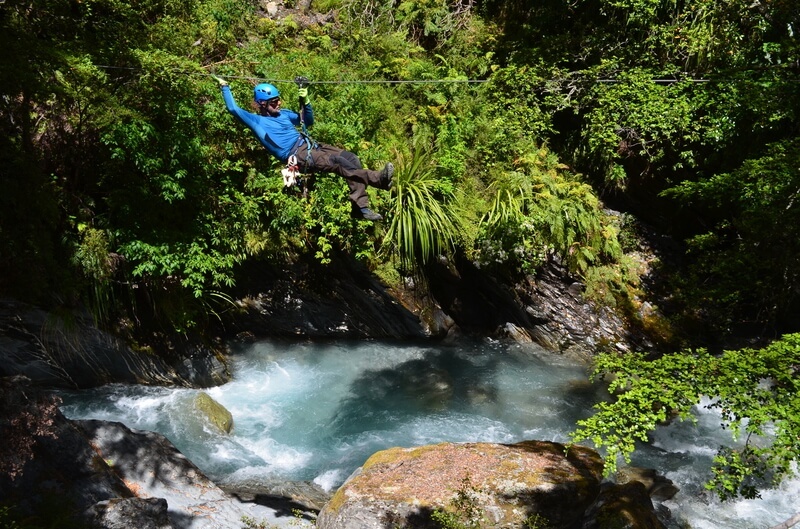 Full safety gear and training on our low practice line will be provided by our fabulous guides before you begin so no experience is required; just an adventurous spirit. 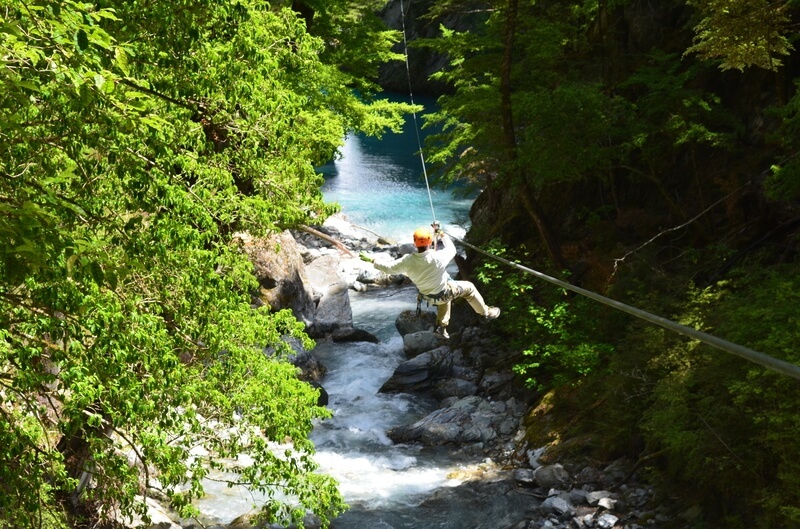 The guides will also attach you onto each zipline, work the brakes for you at the end, take you off the zipline and attach you to the safety line leaving you to enjoy the exhilaration while soaking up the scenery. 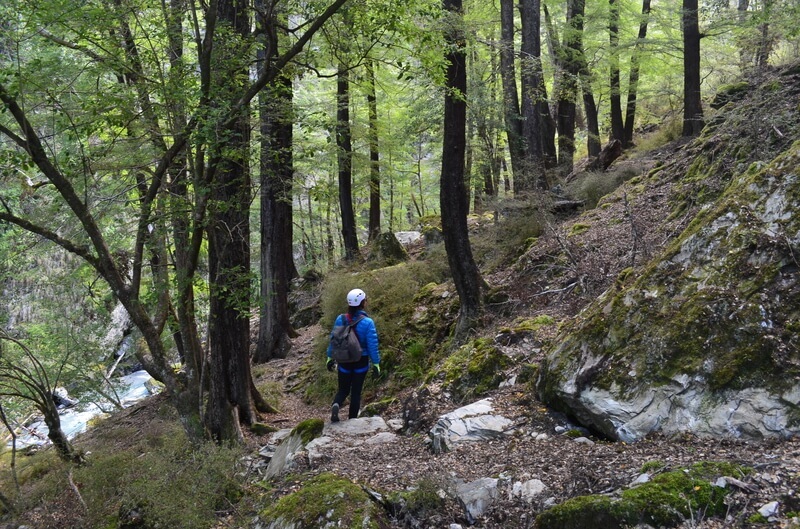 A leisurely 15minute uphill walk through the native red beech forest takes you up to the start of the zipline course where our first line launches off a cliff and travels high above the Oxburn Stream giving a panoramic view of the course and the surrounding mountains made famous by Lord of the Rings, which are the backdrop to an area officially named Paradise. 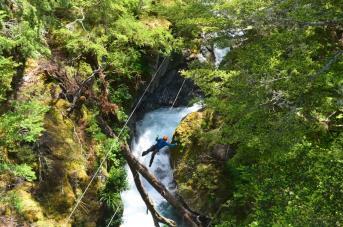 Our next two lines are a canopy tour through the pristine native red beech forest, weaving up stream, then it's time for our favourite line - The 'Orc Chasm' - zipping 200 meters through a tree tunnelled slot canyon and over the alpine stream's chasm. 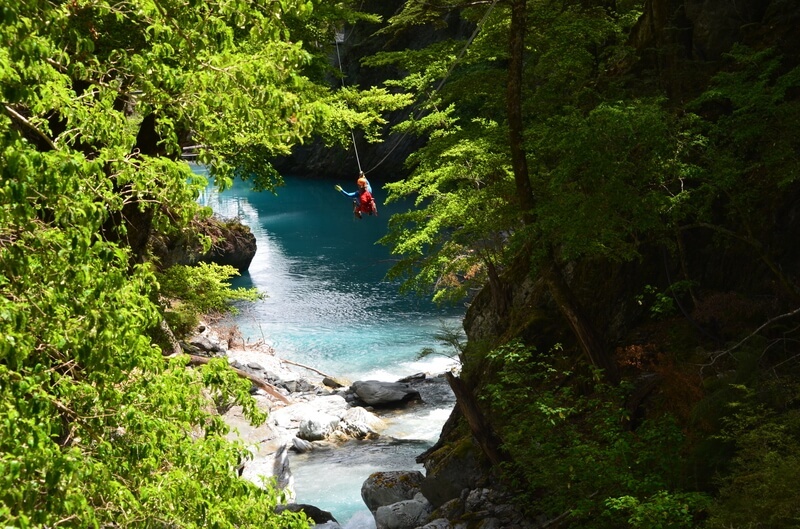 The next three lines weave us downstream just meters above the rapids, following the curves of the alpine stream deep within the canyon, bringing us to the final line, the stunning 'Blue Lagoon'. 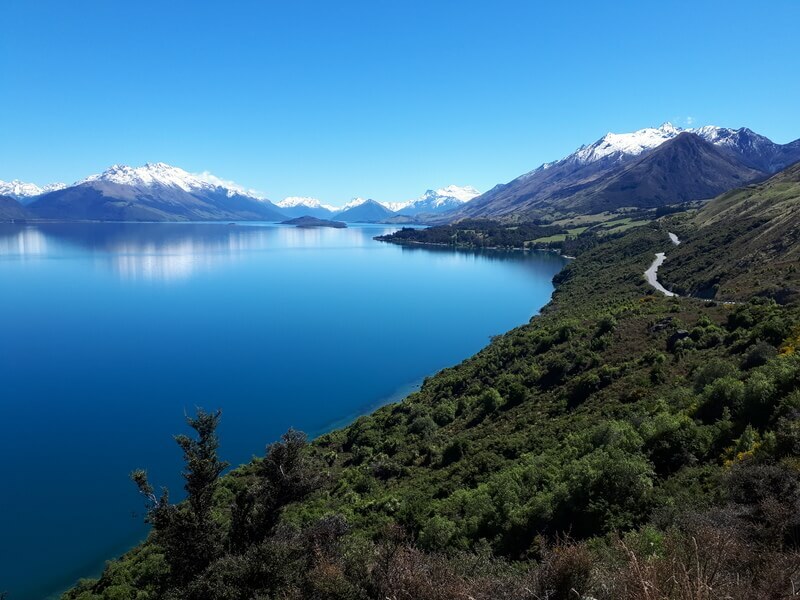 Ranked by many as one of the top 10 drives in the world, and one of the best things to do in Queenstown, the drive from Queenstown to Glenorchy is not to be missed during your stay. Our 8am and 1.30pm trips from Queenstown in our van allow you to sit back and soak up the stunning scenery on your way to the regions best ziplining activity, stopping for photo opportunities along the way as our driver shares snippets of history, local legends and famous movie scenes from Lord of the Rings and many others. 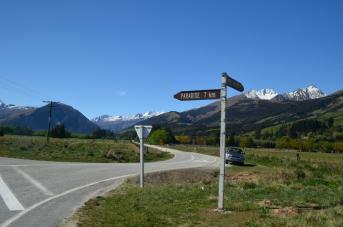 Our 10.30am, 12.15pm and 3.15pm from Glenorchy allow you to save yourself $10 p.p. 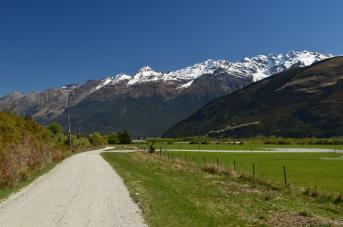 by driving yourselves to Glenorchy and meeting us there. 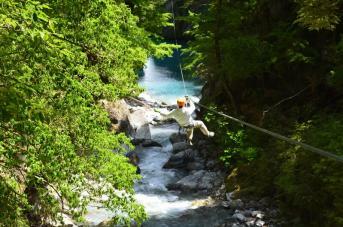 Free shuttle to our site 10 minutes away. 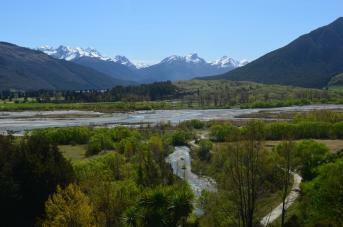 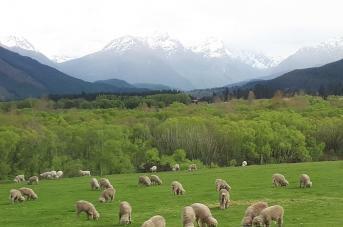 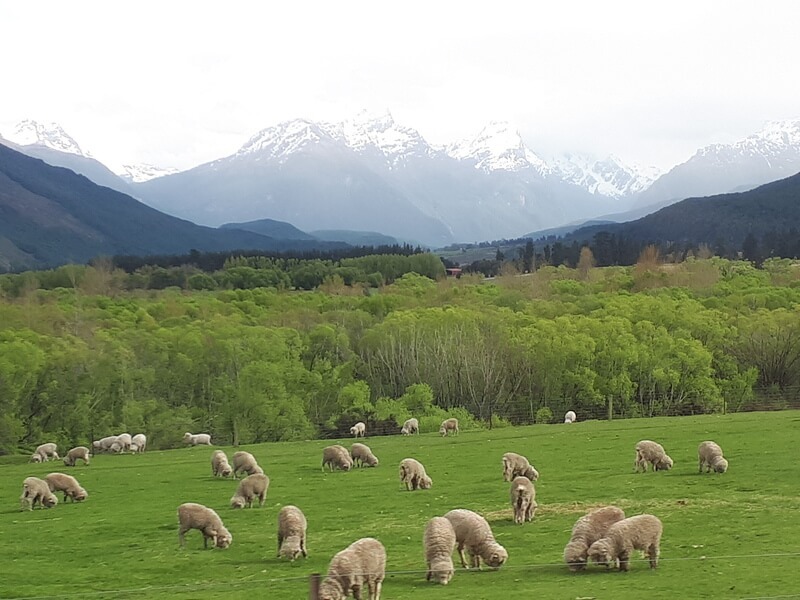 You can check out the area around Glenorchy at your leisure before or after the trip. 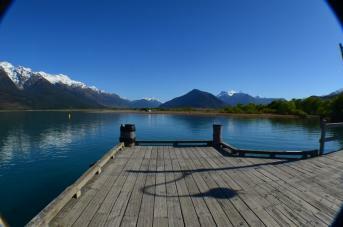 Glenorchy is an outdoor paradise, with some great cafes, short or longer hikes and small town charm. If you have people with you not participating in the ziplining, they can hang out in Glenorchy. 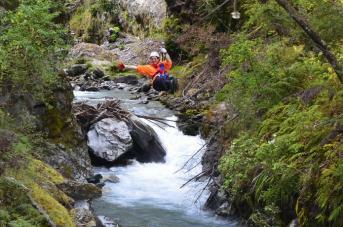 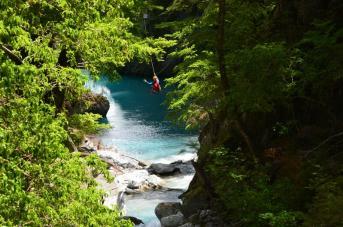 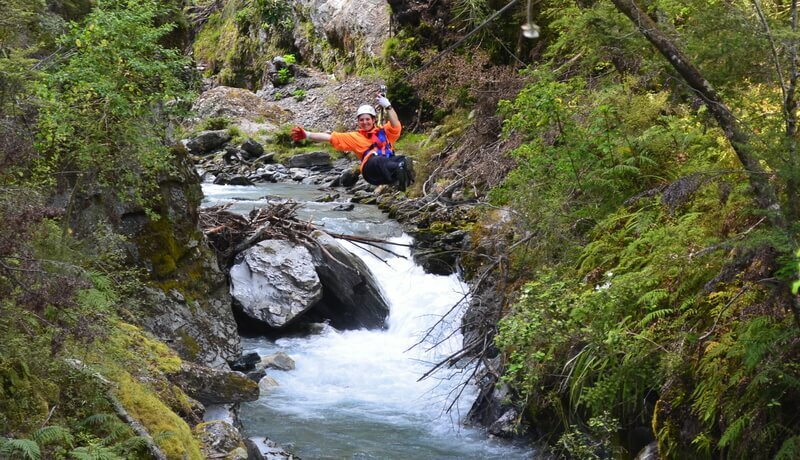 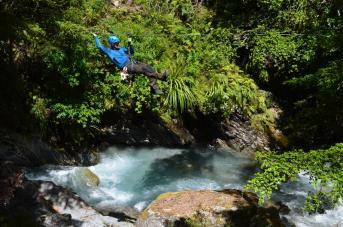 Our 8 zipline course takes you 1000m through beautiful mature forest over a pristine alpine stream.